As troubled Japanese auto supplier Takata Corp. prepares for a possible U.S. bankruptcy filing, potential bidders are poring over a recent U.S. court ruling that could expose a buyer to liability for the company's defective airbags, sources have told Reuters. Takata faces potentially billions of dollars in costs from the world's largest automotive recall, stemming from millions of its airbags that were equipped with malfunctioning inflators. The company has said it is seeking a financial backer. But interested bidders, if the parts maker goes up for sale, want Takata to put its U.S. business into bankruptcy first, the sources said. Autoliv Inc., Key Safety Systems Inc., Flex-N-Gate Corp. and Daicel Corp. -- bidding together with Bain Capital LP -- proposed bankruptcy for Takata’s U.S. unit at meetings with automakers last month in New York as a way to limit liabilities, people familiar with the process told Bloomberg. Generally, U.S. bankruptcy law allows a bidder to buy assets free and clear of lawsuits and other liabilities, and the selling company uses the money to repay its creditors. General Motors used the strategy when it filed for Chapter 11 bankruptcy in 2009. The automaker quickly sold its best assets to a so-called "new GM," scrubbed free of billions of dollars of debt, which enabled the company to withstand an economic crisis. In July, the 2nd U.S. Circuit Court of Appeals in Manhattan held that General Motors Co., the "new GM," could be sued over faulty ignition switches made by "old GM." The ruling set what some see as a troubling precedent. "What that says to me: buyer beware," said Henry Jaffe, a bankruptcy lawyer with Pepper Hamilton in Wilmington, Del., who represents debtors and creditors. 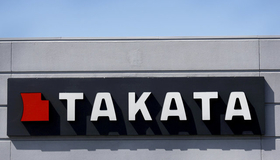 Jaffe said the ruling could undercut what bidders are willing to pay for Takata. Takata's airbags use a chemical compound that can explode with excessive force after prolonged exposure to hot conditions and have been linked to at least 16 deaths globally, mainly in the United States. About 100 million Takata airbag inflators have been classified as defective, leading to continuing safety recalls. Last month, the company received proposals from five bidders, all of whom have presented plans that require Takata to file for a GM-style bankruptcy protection. Takata's creditors include automakers who want to be reimbursed for millions of dollars spent on recalls. They may also demand that any buyer of Takata's assets share in some of those costs. The automakers could also try to use the tools of bankruptcy to protect themselves from lawsuits by car owners for the faulty airbags, according to bankruptcy attorneys. The U.S. government is also likely to play a role. Takata is operating under a five-year, $200 million consent decree with the U.S. National Highway Traffic Safety Administration. Given the uncertainties, bidders could propose using "holdback," bankruptcy lawyers said. Some sale money would remain in escrow and be used to settle any unanticipated legal claims against the buyer. Over time, unused money would be released to the Takata bankruptcy estate. Takata and its creditors would likely resist a holdback, lawyers said. In Japan, Takata CFO Yoichiro Nomura told reporters on Friday that the company hoped to reach an agreement with its automaker customers on a restructuring by year end. He said the company preferred to avoid bankruptcy. Takata has posted a net loss in three of the past four financial years, but it remains one of the auto industry's biggest suppliers of airbag systems. The company is also one of the world's top seatbelt producers, and makes steering wheels, electronic control units and child safety seats. To get a sale approved quickly, a Takata buyer may have to assume some legal obligations, an approach used by "new GM" which took on 15 categories of liabilities. "That will give a buyer heartburn," said Bill Weintraub at Goodwin Procter in New York, who worked with ignition switch plaintiffs on the GM appeals court case. GM has said it plans to ask the U.S. Supreme Court to review the July ruling, which it said wrongly punishes it, the buyer, for mistakes made by "old GM," the seller. The company and business groups have argued that the ruling, if allowed to stand, will depress the value of assets that are sold in bankruptcy. Those who are close to GM and Takata are quick to point out the situations of the two companies differ in key ways. Takata's airbags have been subject to headline-grabbing recalls for years. By contrast, some GM engineers knew its ignition switches were faulty when it introduced them in 2002 but concealed the problem until 2014, five years after its bankruptcy sale. Because of the concealment, the court of appeals reasoned that GM's customers had been denied the opportunity to object or file a claim over the ignition switch defects as part of GM's bankruptcy and sale. To remedy the lack of notice, the court said car owners could pursue a class action against the buyer of GM rather than the bankruptcy estate. Takata's notoriety could work to the advantage of bidders, ensuring potential claims have been identified. "You have a known problem," said bankruptcy lawyer Ed Weisfelner, who also represented some ignition switch plaintiffs in the GM appeal case. The GM ruling only binds U.S. Bankruptcy Courts in one of 11 U.S. judicial circuits, and Takata may look to other courts. In its appeals case, GM cited precedent in the 3rd U.S. Circuit, which it said is more protective of buyers in bankruptcy sales. Takata's main U.S. subsidiary, Michigan-based TK Holdings Inc., is incorporated in Delaware, giving the company access to the state's prominent bankruptcy court and 3rd U.S. Circuit precedent. "Any bankruptcy judge will be really nervous about this one," said John Pottow, a professor at University of Michigan Law School who specializes in bankruptcy. Additional reporting by Kevin Krolicki and David Shepardson in Washington, Jessica DiNapoli in New York and Naomi Tajitsu in Tokyo.